Ueberschall are probably best known for their Elastik‑based sample libraries, which currently run to over 60 titles. The key features of the Elastik front end are its tempo- and pitch‑matching capabilities, which allow loops to be easily blended into a musical project. The company have recently introduced Elastik 2, the first major update of the software since its original release. While this is now bundled with all the new Elastik libraries, it is also available as a free download for existing users. Having reviewed a number of these libraries for SOS over recent years, I have to say the original Elastik interface did grow on me. While a little quirky, it is both efficient and flexible, so I'm interested in what v2 might bring to my own well‑established Elastik workflow. 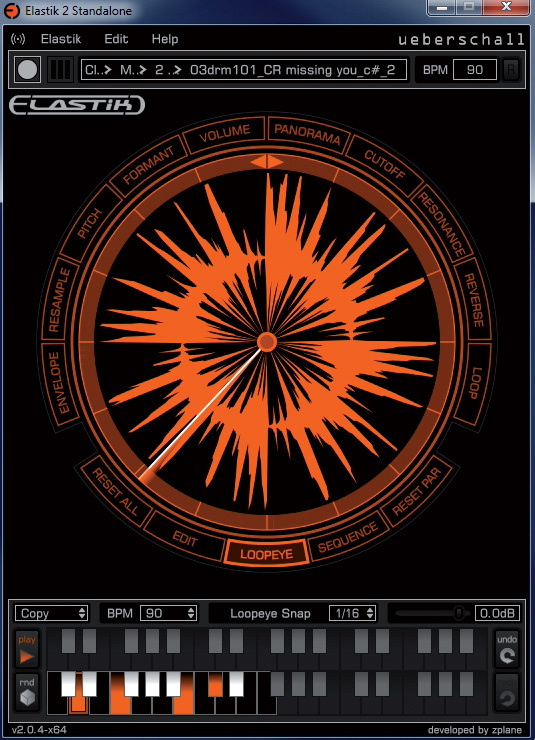 Elastik 2 is available for PC and Mac and supports VST, RTAS and AU plug‑in formats, as well as a stand‑alone version, all of which work in both 32‑bit and 64‑bit versions. 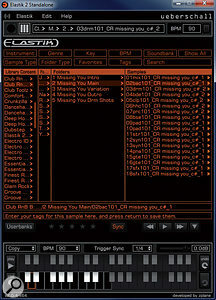 I tested it on a PC system using both the stand‑alone version and the VST plug‑in, with Cubase 6 as the host. Installation of the software was hitch‑free and my existing Elastik libraries were all recognised. The library authorisation process has been improved in Elastik 2. Libraries are registered online via serial number if purchased on DVD or automatically if purchased as a download. Once registered, authorisation requires an authorisation file to be downloaded but, usefully, a single file will deal with all the libraries registered to your account. There is also an offline process for those who like to keep their music computer well away from the Internet. For long‑standing users, there is certainly a major visual difference between v2 and the original. Gone is the rather grey 'brushed metal' look, replaced by a much more modern and hi‑tech appearance. Cosmetics aside, the key elements of the new interface are still familiar: the central, 'Loopeye' sample display and, at the bottom of the window, the dual-layer Key Assignment area into which loops can be loaded and mapped. The new Browser window makes searching and navigation for samples much easier. Alongside these familiar features, there are also two significant changes. Firstly, the sample-editing options are now displayed as a series of buttons around the central Loopeye, and these offer some useful new functionality. Secondly, the previous drop‑down menu‑based sample‑selection system has been replaced by a completely new Browser window. Users can toggle between the Browser and the Loopeye display via the two buttons located at top left, but the Browser also opens as soon as you click on the Mini‑browser above the Loopeye. This strip shows the folder path to the sample currently displayed in the Loopeye and clicking on the strip automatically opens the Browser in that location. This is very useful if you need to find a related sample from the same library. In use, the new Browser is a big plus. Individual samples can be auditioned from the Browser using the little 'play' buttons located to the far right of the file name. Once you've found the sample you're after, it can be dragged and dropped from the Browser onto an empty slot in the dual‑layer Key Assignment area at the bottom of the window. Multiple samples can be selected (for example, all the loops in a single construction kit), and dragged and dropped in one operation. The Browser also includes very effective filter‑based search capabilities, making it easy to track down what you need. Samples can be triggered directly from the Key Assignment area or via MIDI. Elastik 2 allows you to tempo‑match any loops to other elements of your arrangement, and you can also control the resolution of the sample triggering to keep everything nicely locked onto the beat or bar. The Play button (to the left of the Key Assignment area) allows you to trigger multiple samples, to easily audition how different loops sound together. Samples can also be copied from one key to another in the Key Assignment area. While this is useful if you want to create a copy for editing, two other 'copy' modes can also be selected: Chromatic and Slices. The former takes the sample and simply maps it chromatically across two octaves, while Slices mode chops a loop into slices and maps these over consecutive keys. These features are described in more detail below. 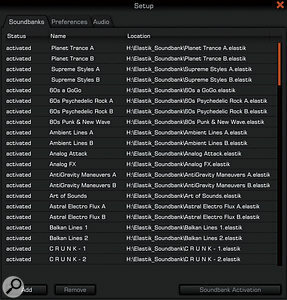 Multiple library soundbanks can now be activated as a single process. Visually, the Loopeye has always been Elastik's most distinctive feature, with its clockface‑style waveform display and, while unusual in appearance, it is fairly intuitive to use. Once the sample is triggered, the cursor sweeps around the waveform once for each repetition of the loop. The grid around the edge of the sample shows the Loopeye's Snap resolution (by default set to 1/16) and can be adjusted via the setting above the Key Assignment area. This setting divides the sample into the appropriate number of segments, so, for example, with the 1/16th setting and a four‑bar loop, each segment represents one beat of a bar. These segments provide an easy way to edit loops into shorter phrases. For example, if you have a four‑bar drum loop with a fill in the last bar that you want to use more often, you can easily isolate the final bar fill and trigger just that. Snap can also be turned off, to give complete freedom of selection. The labels around the outer edge of the Loopeye provide access to various processing options. These operate in two modes, selectable through the Edit and Sequence buttons. 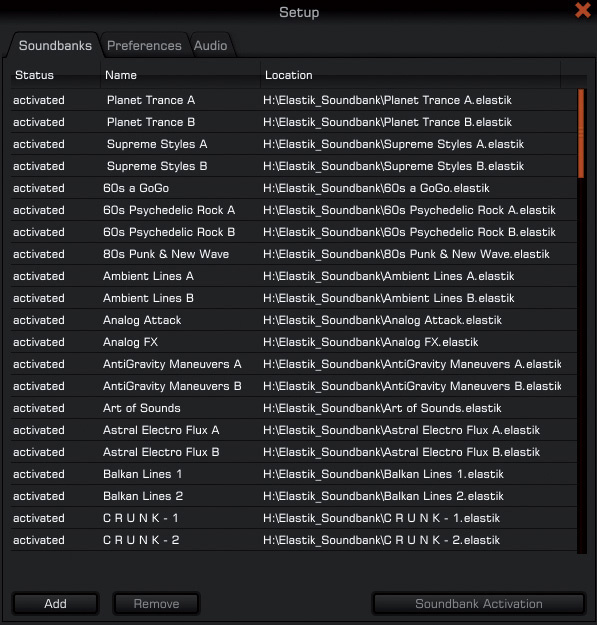 Edit mode allows parameters such as volume, pan, pitch, filter cutoff and filter resonance to be set for the whole loop, while Sequence mode allows settings to be made individually for each 'slice' of the waveform. For example, in Edit mode, selecting Cutoff automatically also selects Resonance, and an X/Y‑style editor is displayed to let you adjust these filter parameters. Other pairs of parameters operate in a similar fashion, while further parameters are adjusted individually. When Elastik is used as a plug‑in, they can all be automated for real‑time control. 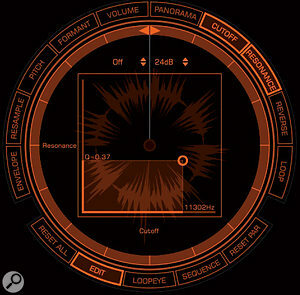 By contrast, Sequence mode allows you to edit the same parameter set for individual 'slices' of the Loopeye waveform. As shown in the screen to the right, the display looks rather like a cake cut into slices, and the length of the slice can be adjusted to change the value of the currently selected parameter. This offers a very easy way to add a little spice to a loop — for example, reversing a couple of beats in a drum loop or panning alternate slices of a synth track left and right. 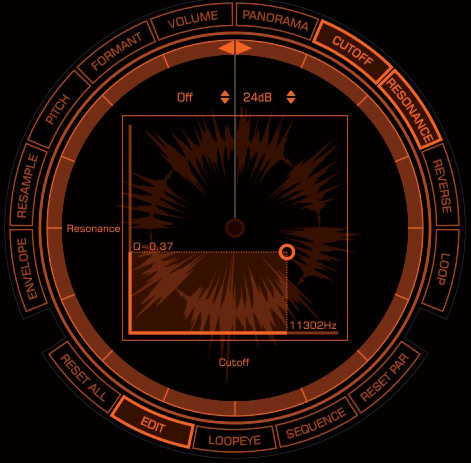 In Edit mode, parameter changes can be applied to the whole loop. As indicated earlier, when you're copying samples in the Key Assignment area, the Chromatic and Slices copy modes provide extra options. Chromatic mode can, for example, be used to take a single bass note and essentially create a playable bass instrument from it, by mapping it across two octaves. This is great for creating new melodic phrases with sounds originally derived from loops. As might be expected, Slices mode chops a loop into slices and maps these over consecutive keys, whose individual slices can then be triggered via MIDI. 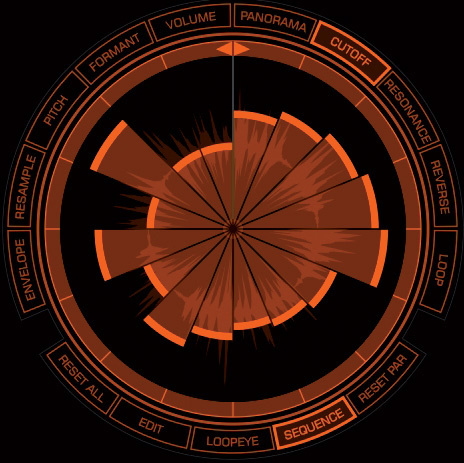 While this works well enough, the slices are based on the divisions in the Loopeye rather than transients in the loop, so this process is perhaps not as useful as a true Recycle‑style slicing process. That said, if you want to extract a combination of kick, snare and hi‑hat hits from a loop, copying the loop to three empty keys and then editing the Loopeye for each, with Snap turned off, allows you to isolate individual hits easily enough. In addition, many of the construction kits in the Elastik library series very usefully include single drum hits, so if you want to build your own drum-pattern variations, there are plenty of ways to do it. The other key feature for adding some variety is the Random Sample (Rnd) button. If you select a currently loaded sample in the Key Assignment area and then press the Rnd button, Elastik will search through the available libraries and replace the selected loop with something similar. As the name suggests, this is a somewhat random process, but it can throw up some interesting results, particularly with things like hi‑hat, kick, snare, percussion or bass loops. The process does not take musical key into account, so with melodic phrases you might also need to do a little pitch shifting. Otherwise, it's good fun and often comes up with something very usable. In Sequence mode, parameter changes are made at slice level. Two other feature changes are worth commenting on. Firstly, something new that is included: Elastik 2 now offers real‑time time‑stretching. While loops are automatically tempo matched to the current project when they are loaded, enabling real‑time stretching (via the Setup > Preferences page) allows Elastik to follow tempo changes within your project in real time. When testing within Cubase 6, a small additional CPU load was incurred, but whatever algorithm is sitting behind this processing, it works pretty well. I was able to take drum loops through some pretty radical tempo changes — both jumps and ramps — while the audio playback remained very smooth. The other feature is one that has disappeared. Previously, Elastik offered multiple audio-output channels so, for example, you could return your drums, bass, synths, and so on, on different stereo channels if you wanted to apply separate processing to particular instrument groups inside your host DAW. This feature has now gone and Elastik returns all the audio via a single stereo output pair back to the host. In practice, I didn't find the loss of this capability too much of an issue and simply opened multiple instances of Elastik to achieve the same result. Given that the plug‑in doesn't generate much in the way of CPU overhead (particularly if the real‑time stretching is switched off), this is a simple and effective workaround. Rubber Stamp Or Rubber Band? In use, both as a plug‑in and stand‑alone application, Elastik 2 performed flawlessly on my test system. If you are an existing Elastik user, downloading the free update is simply a no‑brainer — the new interface, despite its very different styling, brings a big improvement in both ease of use and functions. For potential new users, the question of whether they'll want to get into the Elastik way of doing things will depend on the appeal of the available Elastik‑format sample libraries themselves. Having had the opportunity to explore a good number of these in some detail, I would say that the standard seems consistently high, and if even a few of the libraries fit your needs stylistically, Elastik 2 is well worth getting to grips with. Indeed, given the suite of tools for loop manipulation on offer and the fact that the new interface makes for a very intuitive working environment, Elastik 2 is well worth the stretch. It is difficult to suggest direct alternatives to Elastik. While almost any modern DAW allows tempo- and pitch-matching of loops, these tend to be generic features for working with WAV or REX loops. The same is true of many plug-ins, instruments or samplers that offer loop manipulation, such as Kontakt, Phatmatik Pro or UVI Workstation. But, as a dedicated loop- and sample-manipulation front-end for a substantial (and growing) loop library series, Elastik is pretty much unique. The Elastik library collection now runs to over 60 titles, covering a wide range of genres, from the kitsch of 60s A GoGo to the slickness of Soulful Pop. While titles such as Indie Rock, Metal, Glam Rock, Jazz Colors and 60s Psychedelic Rock show that Ueberschall have fingers in many stylistic pies, the collection is perhaps more heavily weighted towards electro, hip-hop, RnB, house and other dance styles. There are also a number of libraries aimed more specifically at composers working to picture, such as Scoretrax and Soundscapes. Having had the chance to audition many of these libraries, I've always been impressed by the overall quality of what is on offer, regardless of the genre, and this is reflected in the regular four- and five-star ratings awarded by various SOS reviewers in recent years. In short, the sample content of Elastik libraries is both diverse and of a high quality, and anyone who uses loops in their compositions should find something of interest there. 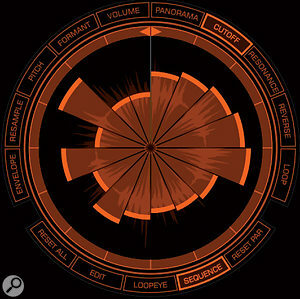 Offers a good range of tools for loop manipulation. Another front-end to learn — but a shallow learning curve. Multiple outputs no longer available. 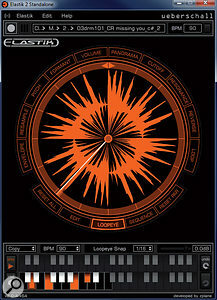 Elastik 2 is a very good tool for tempo-matching loops and includes a useful set of loop manipulation options. If the libraries themselves appeal, Elastik 2 is most certainly worth getting to grips with. Elastik 2, free upgrade; full sample libraries (including Elastik) from £89. 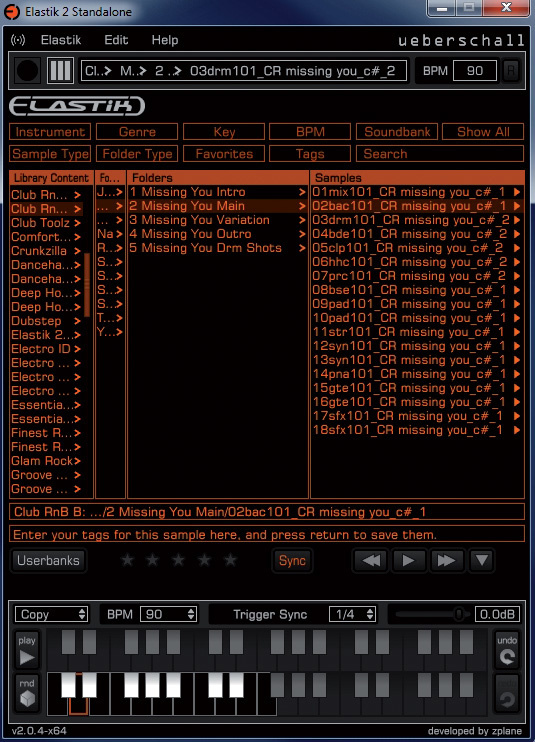 Elastik 2 free download; full libraries from $139.95. Intel QuadCore Q9650 3GHz PC, 8GB RAM, TC Electronic Konnekt 24D interface, Windows 7 Ultimate 64-bit.